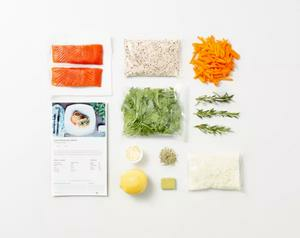 Fresh Prep is a meal kit delivery service based in Vancouver. Founded in 2015 by Becky Brauer, Dhruv Sood and Husein Rahemtulla, Fresh Prep delivers everything needed to make healthy meals at home using fresh ingredients in 30 minutes. With a focus on sustainability, pre-chopped ingredients are delivered in reusable cooler bags with fresh, locally sourced ingredients whenever possible. Meals are affordable, diverse, take less than 30 minutes to make and fit the needs of individuals, couple or families. This service is currently offered in 20 municipalities throughout the Lower Mainland, BC as well as in Victoria, BC. Designed by chefs and nutritionists, enjoy delicious new meals every week using high quality, fresh ingredients--local and organic as much as possible. All meat is raised without unnecessary antibiotics and hormones, All seafood is wild caught or sustainably sourced and recommended by Oceanwise. It's better for you, our community, and it simply tastes better.